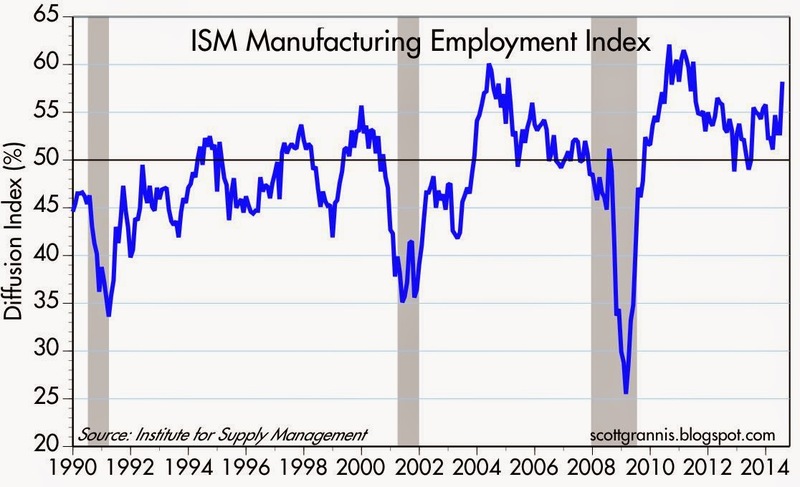 The July ISM manufacturing survey was solid, confirming that the economy is at almost zero risk of losing forward momentum. The Eurozone, on the other hand, is facing serious headwinds that have all but stopped the economy in its tracks. The market has accepted the fact that a modest tightening of U.S. monetary policy is on the horizon, but pervasive weakness in the Eurozone has convinced the market that an ECB tightening is still years away. 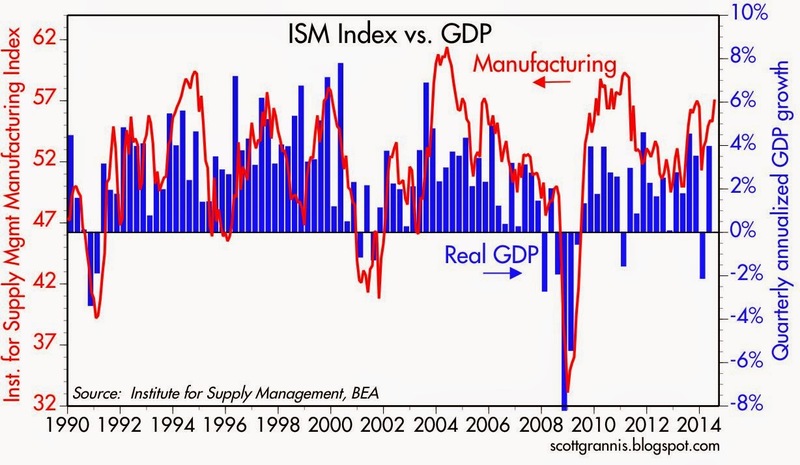 The ISM manufacturing index is consistent with overall economic growth of at least 4%, but we are unlikely to see that because other sectors—housing, business investment—are still growing very slowly. The employment subindex is very encouraging, suggesting that manufacturing firms are becoming more optimistic about the future. 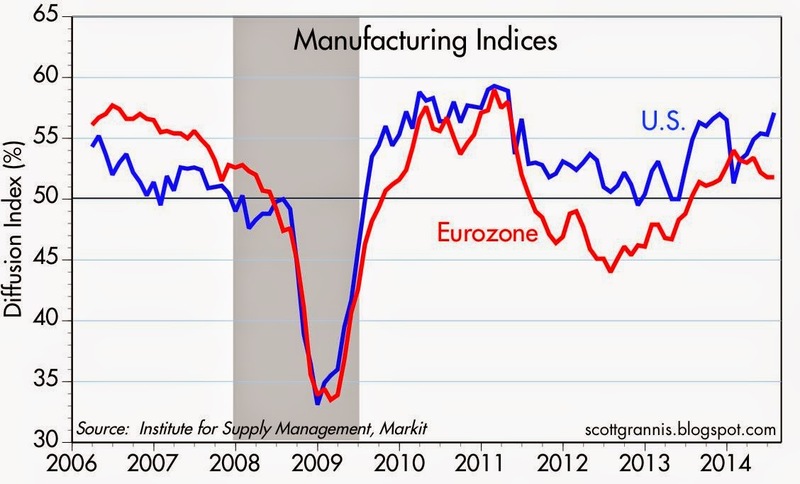 The improvement in the Eurozone manufacturing sector that began last year has faded away this year. The U.S. economy is clearly outperforming. 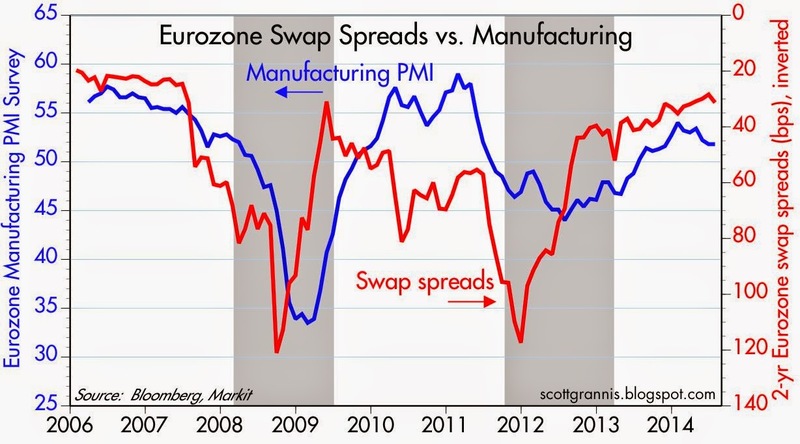 Eurozone swap spreads are still relatively low, which suggests that the underlying monetary fundamentals of the Eurozone economy are still relatively healthy. At the very least this suggests that the problem in the Eurozone is not due to an overly-tight ECB. It's simply that Europe has too many problems—in particular the fallout from the Russia/Ukraine situation—on its plate and thus future growth is likely to be very slow. The outperformance of the U.S. economy is being reflected in the equity markets. 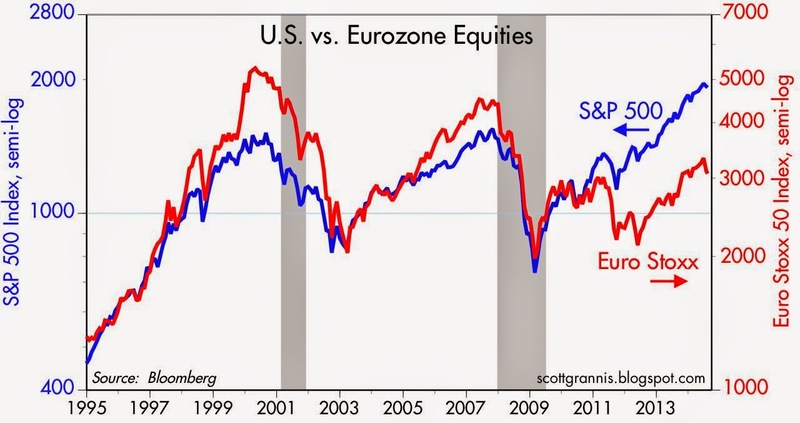 Since mid-June the S&P 500 has outperformed the Euro Stoxx index by 6.5%. The gap between U.S. and Eurozone 10-yr yields has rarely been wider. This is yet another reflection of the relatively weak outlook for the Eurozone economy. U.S. yields are holding at 2.5% despite the near-certainty of the unwinding of QE and higher U.S. short-term interest rates. Eurozone yields are still falling, however, as the market calculates that pervasive economic weakness in the Eurozone will keep ECB policy on hold and near zero for a very long time. 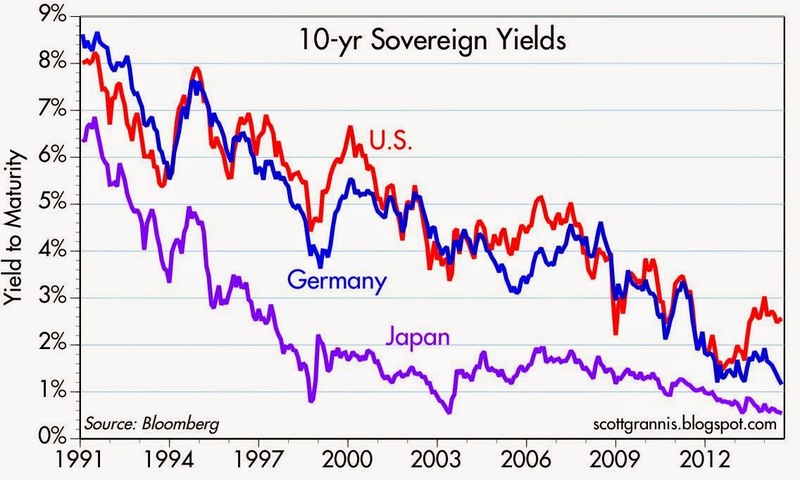 2-yr sovereign yields tell the same story. They are beginning to rise in the U.S. as the market prices in the expectation the Fed will begin raising short-term interest rates by April or May. But they remain at near-zero in the Eurozone as the market cannot yet foresee when the ECB will take similar measures. I can't logic this out but how do we know what is driving rates. - because the US economy is moderately improving compared to other areas (euro zone), therefore the demand for US dollars is increasing globally (especially relative to Euro) and therefore the cost of borrowing US dollars is rising? The Eurozone is on the cusp of deflation. Japan has been through this---the only answer is aggressive QE. The USA Fed went to QE, and the ECB did not. Of course, structural improvements are needed in every developed nation. But monetarily suffocating an economy does not fix structural impediments. What evidence do you see that points to deflation in Europe? Inflation is certainly low, but low inflation doesn't necessarily cause deflation. Tight money causes deflation, but there are few signs that money is tight. 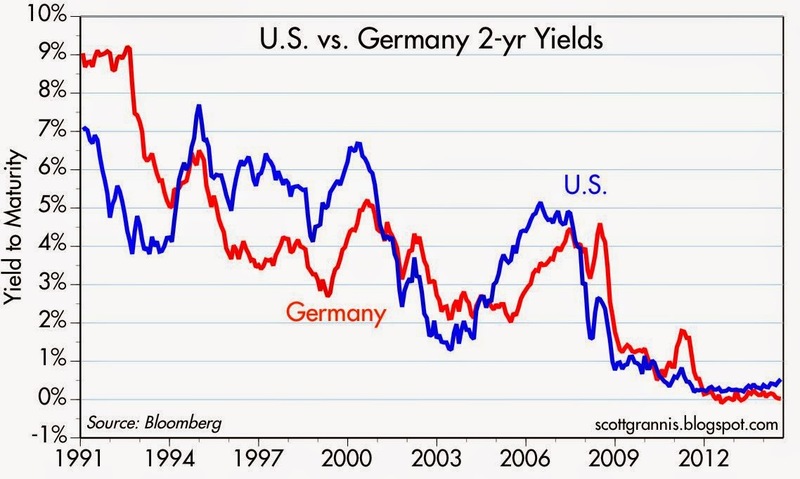 Tight money usually results in high real interest rates, but real rates are very low in Europe. Tight money also usually results in a flat or inverted yield curve, yet the European yield curve is still positively sloped. Tight money should push credit spreads wider, since it increases default risk, but that is not the case in Europe today. Swap spreads are at post-recession lows, in fact. Tight money usually results in a stronger currency, but the Euro today is falling. The yen was another story entirely, since it rose against all other currencies for decades. Not so with the Euro. And even if Europe were "on the cusp of deflation," why is that necessarily a bad thing? Well...I say the "cusp" as ECB now at 0.5 percent inflation, and falling. Deflation wrecks Western economies---we saw that in Japan. Property values fall, then banks slow lending...egads. Then equities tumble. And read your Milton Friedman! Tight money results in lower interest rates. Lenders do not fear inflation, maybe ponder deflation, when money is tight. Friedman was a fan of QE, advocated for Japan. I think he would tell the ECB the same thing (although he thought an ECB was bad idea, and he has been proven right. Tight enough for Germany is too tight for PIGS). Since true structural reforms are nigh impossible in Western democracies (try getting rid of food stamps or the VA) central banks are suffocating economies but without benefit. The Reserve Bank of Australia appears to doing a great job---and they have a inflation band target of 2-3 percent. The People's Bank of China has also seen strong growth, and they have a 4 percent inflation target. I suspect both China and Australia have structural impediments as bad as, or even worse than those of the USA's. But they have growth-concerned central banks. Other than a Switzerland or Luxembourg (which are sort of boutique economies), is there a major developed nation in the post WWII era that has prospered at measured zero inflation? I can't think of one--but we saw tremendous prosperity in the USA through various periods of moderate inflation (1982-2007 comes to mind), and Japan's boom-boom 1980s, or the China's boom, all in inflationary periods. It may be prosperity generates some inflation---bottlenecks send out price signals. That is the price of growth. But the price signals compel new supply. Certain real estate rises in value, slowly bringing on new supply, or raising prices when supply is crimped by regs (think OC). But jeez, should we dispense with prosperity to keep a subjective nominal price index at 100 exactly? Commercial and industrial loans well up, new all-time records. This puzzles me. We keep hearing that American corporations are not investing. Yet, C&I loan volume is now double that of 2005. Banks are lending to commercial and industrial enterprises at double the rate in the thick of the Bush years. (Don't get me wrong; I think Obama is a mediocre president. I am just pointing in this out). I gotta say, this is one of the screwiest economic periods of all time. Record corporate profits by a wide margin, but weak growth and demand, huge bank lending, yet people say they are not investing. Near-zero government bond yields certainly allow the governments of Japan and the Eurozone to keep borrowing to fund their social welfare spending. Yet bank credit remains tight for other borrowers, particularly in the Eurozone. The accommodative monetary policies of the BOJ and ECB remove all the pressure on their governments to rein in their fiscal excesses. (2) In the Eurozone, the Economic Sentiment Indicator recovered smartly last year, but has stalled over the past four months through July. Most of the region’s survey-based economic indicators have been upbeat for the past year. However, the actual economic recovery has been extremely weak. This is confirmed by the flat trend in the forward earnings of the EMU MSCI over the past year as analysts’ consensus earnings expectations for 2014 and 2015 continued to plunge through the week of July 17. Yardeni is in error and makes a mischaracterization when he calls ECB's monetary policy "ultra-easy." Do not confuse a central bank nominal interest rate with tightness or easiness. If the central banks of the Western world had been "hyper-easy" and all the other superlatives we have heard in the last five years, we would see inflation by now. Instead, we are looking at deflation in Europe, perhaps 1 percent inflation in Japan and the USA at 2 percent, perhaps. The USA could slide back in a year, without QE. Globally, we are seeing record-low post WWII inflation. This is new---"easy money" that causes deflation. Where is Milton Friedman? This is like your tubby friend who says he is on a "strict diet." "Yes, I have gained only a little weight this year," he says (I have diets like this, btw). The diet may indeed be far stricter than any before in your friend's life. But it is not a strict diet. So it is with central bank policies. Chairman Volcker ran inflation at 4-5 percent in his final months. No one ever calls Volcker "hyper super-duper easy." We have inflation at less than half the Volcker rate now. I will say we have "easy money" when I see inflation ranging up towards 4 percent or so. I think we need inflation in the 2-3 percent range, the Aussie centric bank's IT band. They seem to have a well-running economy. Better some moderate inflation than a Japan-style stag-deflation. Do not have much to say about all this except I would like to gripe about the Vanguard exchange traded fund VIS having just given up all it's 2014 gains in about two days last week (the equal weight RGI is not doing much better). At least the US Industrial ETFs are doing a bit better than the European equivalents (e.g., db x-trackers STOXX Eur 600 IndustGds 1C ETF XSNR). Still waiting for the much trumpeted take off for Industrial sector. Thank goodness for GBX and TRN. "Do not have much to say about all this except I would like to gripe about the Vanguard exchange traded fund VIS having just given up all it's 2014 gains in about two days..."
Perry, equity markets are long over due a good stiff 10+ % correction. The US market has gone up for almost 2 1/2 years without more than a 5 - 7 % setback. A 10 - 15% correction would be quite normal.